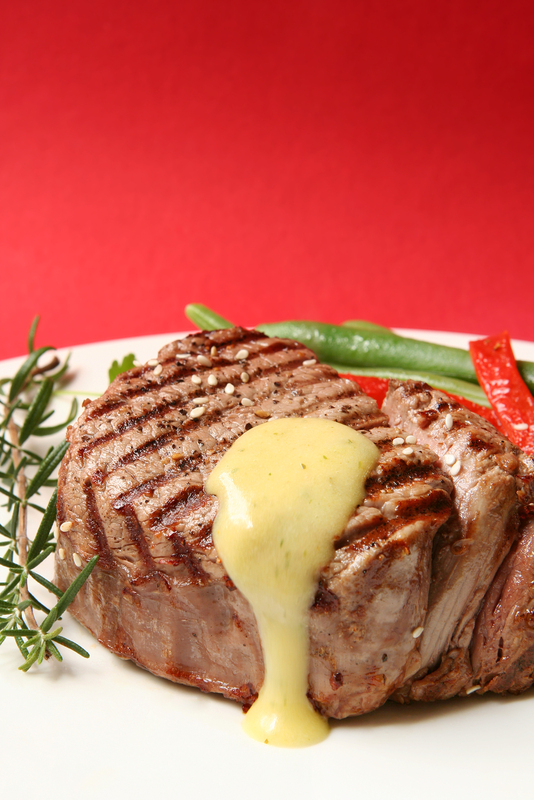 Thick filet mignon with bearnaise sauce green beans and red peppers and a sprig of rosemary. Red background. Creating your own sauces adds flavor instead of fat when finishing a plate of delicious food. It can add that extra delicious mouthfeel that improves your feeling of satisfaction. You just spent a lot of time making the meal. So why not find a perfect way to finish it. You’ll be making restaurant quality meals before you know it. I love a bit of Bearnaise or Horseradish with my steaks. (I add in unsweetened whipped cream to my horseradish sauce so it’s lighter) I don’t need a lot and it makes me happy. Craftsy has a number of really good classes for learning how to make pan sauces. Those are the sauces you make in the pan after you’ve finished cooking, and it uses the flavor as well as some of the fat from what you’ve cooked. You can limit how much fat-to-liquid ratio you use. I personally like lighter sauces that use a lot more of the fond, or the meat that’s stuck to the pan after you pull it out. You will then use some liquid like alcohol to loosen up the stuck bits and get them softened. I’ve watched all of these classes, and it’s definitely helped me finish off the dish. Remember, you can always sign up for Craftsy Unlimited to check out these classes for one low monthly fee. It’s better than Netflix. Ok, maybe not, but it’s right up there for good quality learning. And you can try a 7 day FREE trial on Craftsy Unlimited right now during this promotional period. My latest find is Chimichurri sauce. It adds an amazing herb flavor to the beef that’s refreshing. Just one note…this is not a classic Argentinian Chimichurri sauce. I liked this one because it was more herbs and less oil, and I liked the flavor combinations with adding in lime juice and cilantro. Remember, if you are allergic to cilantro (ptoi! soap! ), add in other herbs. And watch how easy it is to make when the meat is resting. This is also great on fish and chicken. What are your favorite sauces? Leave me a comment and let’s look at how to either lighten them up or make them more flavorful so you can enjoy less. Have You Been Afraid To Try Your Hand At Cooking?